Elizabeth takes after me in that once she gets an idea in her head she has a hard time letting it go until she follows through with it. Her ideas and projects often consume her, and I completely identify. She developed an idea at the beginning of this week to make a nativity completely out of random items she could find around the house. 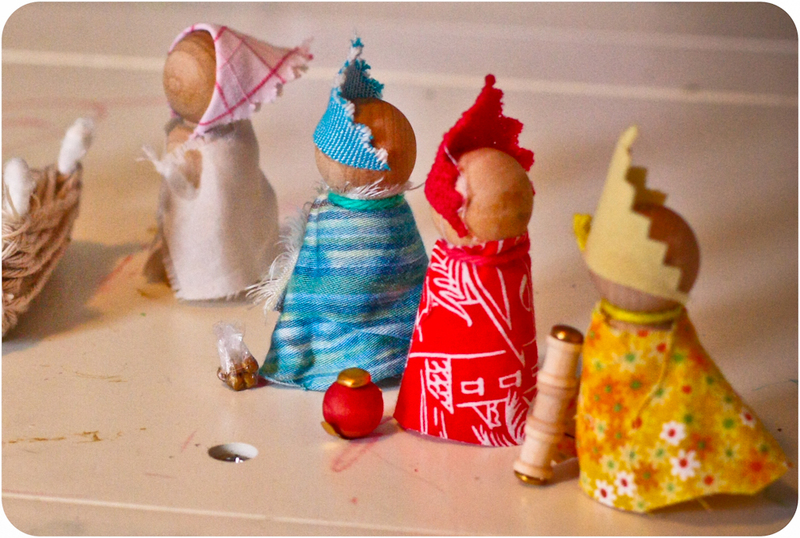 We have quite a supply of little wooden peg people and a basket of scrap cloth. Most of her supplies came from these 2 places. (Don't you *love* Joseph's mustache and goatee! It's the details!) 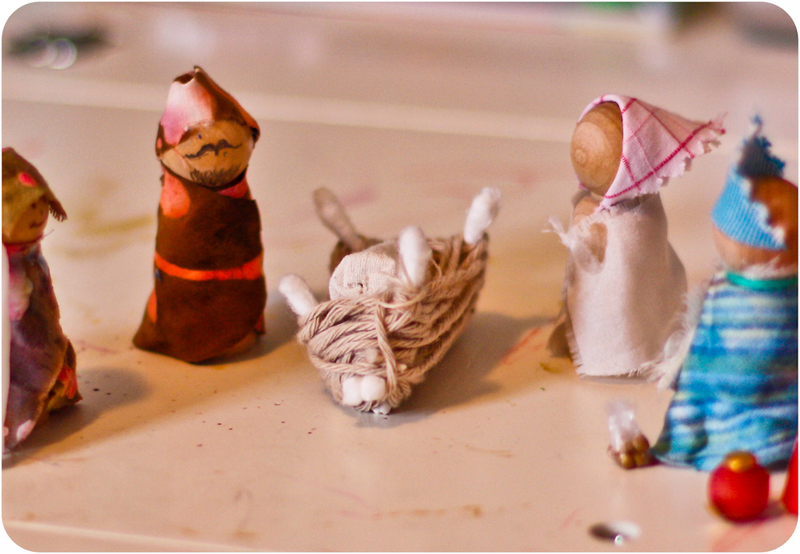 She also used cotton swabs, broken and glued into a rough manger shape then wrapped with cotton yarn. 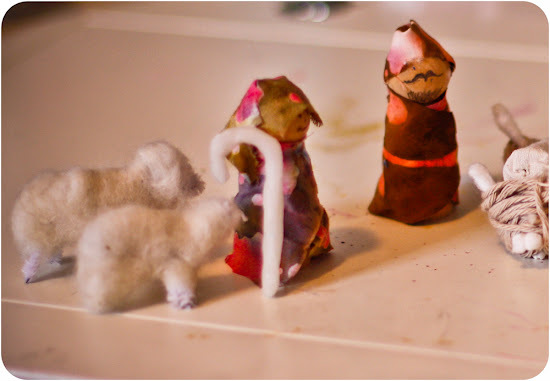 Her shepherd is carrying a shepherd's hook made from modeling wax, and her sheep are pipe cleaners wrapped in raw wool and gently needle-felted. But it's the details of the wise men that I think I love the most: using pinking sheared cloth to represent the crowns with coordinating robes, little balls of gold modeling wax wrapped in plastic wrap for a sack of gold, a metal brad pushed into red modeling wax for a bowl of frankincense, and wooden beads held together with metal brads to represent chunks of myrrh. She's such a creative thing, that girl of mine. And I'm so happy to see these bit and pieces of her imagination come to life. PS. If you want to see a similar nativity made of peg people and felt, complete with directions for making your own, head over to the Magic Onions. She did an awesome job! I love her nativity! 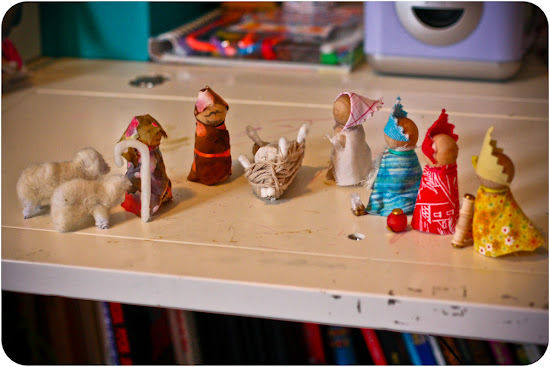 Oh Joy... she's SO clever and creative... this is my kind of Nativity :-) so wonderfully colorful and joyful. LOVE it so much! LOVE the q-tip/string manger!!!! so creative. kids have the coolest little minds. . .
LOVE that girl's energy! Nicely done Elizabeth!